Me and my Valentine at Acadia. Still friends after climbing that thing behind us. “That’s it. I quit.” I lifted myself back down through the crevice, wedging my left knee between the two huge boulders and dangling my right foot into midair, searching for a place to step down to. “We’re almost there! You can do it Robin. I can help you!” my husband pleaded from above. I was beyond help. I was tired, in pain and worst of all, I was sweaty and hot. Now I know the guy knows me well enough to know this is the end of my last thread. “I’m happy waiting right here!” I snapped back at him, then began to mutter that I NEVER should’ve done this in the first place, I’ll NEVER do it again and what’s the point in climbing anyway? I was happy just driving to the top of a mountain. I was even happy climbing halfway up this stupid mountain. The view was just as breathtaking 400 feet below me and I sure didn’t need another twenty feet of pain and terror to get a better view of the mountains and the ocean beyond. I was vexed. I found a little ledge in the shade and peeled off my socks and shoes. Shortly thereafter I heard grunting and snorting above me and watched a young man with a backpack who looked like he was late for a calculus class work his way through the same crevice that I had backed down through, only with less grace I hope. “The backpack throws off my balance,” he explained, a little startled by me sitting there. I nodded and waved as he descended down the trail, wishing I could go with him, but I told C.B. I’d wait. 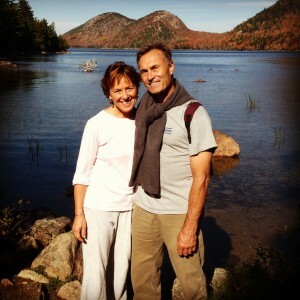 This was our second anniversary trip to Acadia National Park. Last year we hiked up a different mountain. That trail edged along the side of the mountain, so it was like you were walking along the windowsill of a skyscraper the whole way up. I complained and moaned from the bottom to the very top, everything from not being able to breathe to threatening to puke. C.B. just smiled at me and waved me along like I was some kind of Outward Bound drop-out. I said I would hike again, but a kinder mountain, please. I’m thinking there is no such thing. The day before we had gone biking and after three hours I told him I was going to cry if I saw another hill. He smiled and led me back to the bike shop. “You did great, honey. !” Yeah, save it pal. My thighs feel like they have been drawn and quartered. And I’m sweaty. Yuk. C.B. and I met when I was 40. We had both been humbled by divorce. He had been single for nine years; me for three. When I say single I mean alone. We both dabbled a bit with dating, but when a Christian dates it is this awkward circling dance that must end in either marriage behind curtain number one, or rejection behind curtain number two. If it’s not going somewhere then it derails quickly. So singleness can become a way of life. And when you know Jesus, it is not as lonely. I can’t say you are never lonely because God didn’t create us to be alone, hence Eve. But we were kind of used to alone. Anyway, sparks flew. I said Yes. And we both stepped back into the unpredictable waters of marriage. Love does not envy, or boast. I think that marriage is not for sissies. If you want the kind of marriage that God talks about, becoming one, submitting, dying, never leaving or forsaking…it takes guts and courage. It’s the hardest thing I’ve ever tried to do. I’m so good at winning an argument. But I’m so bad at really listening, accepting and laying the whole debate down. Surrender. Ouch. We’ve been married 16 years, which is short time for most people our age. But after the death of a child, moving three times, pastoring for five years, job losses, a cancer diagnosis and repeated solicitations from AARP, we can say that a lot of water has rushed under our bridge and nearly taken the bridge down. There are things I have said that I can’t take back, let downs, disappointments; we could both score high on the sparring field of marital combat. It’s tempting sometimes, to pull out the card and wave it. But God took my card and tore it up. He threw it “as far as the east is from the west”, which I realized as I flew to Korea that it’s so far, it ceases to exist. Precisely. It is not irritable and it keeps no record of wrong. That was both a nod to my nursing profession and good use of his anatomy and physiology class. But besides being grateful for a husband who really does love me, even when I quit on mountains and cry on bike rides, I am mostly grateful for a husband who is steadfast in his love for Jesus, because there at the cross we remember His love for us, a love that gave all, forgave all and the grace that keeps us daily ever pressing closer to what love really means. I confess I still have a ways to go, but I’m liking the journey more and more. We are already planning a return to Acadia next fall. We will climb again because C.B. loves to climb mountains and after 16 years I can truly say I love to follow him. Only I get to pick the mountain. Something friendlier, kinder… maybe I can rent a donkey. But what does love look like? It was the unmistakable voice of God, the press of the words gentle but firm. What does it look like? It seemed enough that I had forgiven the six men responsible for my son’s murder. I said it and meant it, and it was even printed in the newspaper. I’ve spoken to groups of people on the topic, declaring that the evidence of true forgiveness, divine forgiveness, is an abiding love, a holy love that only God can impart. I had said it, and I meant it. But now…OK Lord, I get it. You want me to show it. Those words were a catalyst for a leap into a whole new dimension of my walk with Jesus. Even though I grew up in the Love generation, my philosophy was more like, Take, especially when no one was looking. Make sure no one thinks you actually need them. My on-again, off- again relationship with an alcoholic father imparted a total distrust of men, at least in any arena of expectation or commitment. That seemed okay to me. I was quickly bored with relationships and eager to move on. I left a wasteland of disappointment in my tracks. When I met Jesus I was jumping into my second marriage, and this one would be more of a disaster than the first. But God was trying very patiently to show me a few things about love, His love. I was a slow learner, in the SPED class of Christians. After all, that He could love me seemed outrageous. Then it dawned on me one day…He knows me even better than I know me. And still, He loves me, and wants me to know Him, to draw closer to Him. Amazing. By this time Marriage #2 was crumbling. Alone with two adolescents and a toddler, I felt like the Dunce of God’s classroom. Yet He showed me that He was willing to spend extra after school time with me, tutoring me in True Love 101, telling me of the Greatest Love on earth, His son Jesus. This is what love looked like. I never wanted to remarry. But knowing it was not up to me when a life is fully surrendered to Christ, I put one thing up on my list for a future husband, if it had to happen again. I wanted someone that loved Jesus with all his heart and soul; Jesus first in our lives. And I told God he would have to bring him to me. I didn’t want to go out there and look. One day the phone rang and a strange man who introduced himself as C.B. Farnsworth told me he had heard about me from a friend. I told him I had kids. He said he liked kids. Pause. Did I like ice cream? No. Pause. Coffee? OK, you got me. He came over that summer evening with two Dunkin Donuts coffees and we sat at my picnic table and talked for 3 hours, mostly about Jesus. I had so much fun I even drank his coffee with sugar in it which to this day is so gross to me I have to spit it out. Lest you think I am so spiritual, there were some sparks flying around that night. When four-year old Jake came out on the porch and saw the two of us sitting across from each other at the table, a big grin spread easily across his round little face. CB told me later that he knew that night I was the one. I just knew I wanted to know him more. Fourteen months later we married. What does love look like? A week before the wedding, Jake asked CB if he could call him dad. And so it has been ever since. My husband and I had “Jesus is Lord” engraved inside our wedding bands. That simple declaration has been the rock our marriage has stood upon, surviving the loss of a child, moving to another state, pastoring a church together, a cancer diagnosis and then the usual turbulence that comes with four kids, an uncertain economy, and an empty nest. We are not alike, except for the fact that left to our own, we never would’ve learned how to love anyone. Independent, self-sufficient and stubborn, we were not made to mesh, but God has orchestrated a life for us that has forced us to consider this question over and over. What the heck DOES love look like? Standing at the altar, repeating the vows, we said it but we were one hundred percent clueless as to how to actually apply that to our lives, our marriage. To be honest, which is hard, I am still so selfish and the self-preservation mode is on automatic most of the time. I want to be sure I can deflect anything that could hurt or really just make me feel uneasy and off guard. The older we get the easier it is to just stay in the same groove. I have to work at loving, putting feet and hands and heart to it all. It’s uncomfortable, sometimes scary. But the same Love that died for me, whose love was boundless, continues to pursue me. The words that challenged me last fall keep stretching my heart. My husband is an incredible skier. He’s fun to watch, making what would terrify most people look effortless. He loves it. I don’t get it. 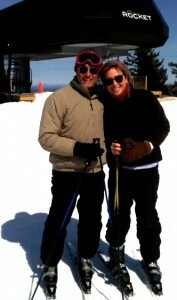 I’ll ski but after I broke my leg at age ten, I skied again only for my kids. They’re gone now so when he announced a ski trip with some folks from church was coming up, I said I would be happy to never ski again for the rest of my life. Besides, I had a thousand things I had to do. Then, the day before the trip, that same question pressed me again. What does love look like, Robin? Darn! So I told him I wanted to go. He looked doubtfully at me. I stink at skiing. He skied the whole day with me. It was one of those wondrous days when you know it could be so ordinary except you can feel God’s pleasure the whole time, and you know He is making it special, fanning the same sparks that flew around us 17 years ago. Riding up on the chairlift together we took in the view, the sun over the mountains, the peacefulness of just being together. “I’m glad you came,” he simply said. I moved closer to him. This is what love looks like. I may be God’s slow learner, but I’m starting to get it and I like it more and more. Someday I might be good at it…loving that is, not skiing. You just have to make up your mind to love people. It’s a simple principle but it never came easy for me. My mom raised us all to suspect everyone’s motives and that most people were too stupid to bother with and my father used to say “It’s a dog-eat-dog world out there” which sounded funny to me until I grew up. Stirred together in a heart that was easily bruised I concluded that people were easier to just stay away from unless they had something I needed. I was a good cynic. I think some people are just naturally loving, like Leo Buscaglia. He probably had a balanced mother. Huggers and nurturers…and I was as cuddly as a cactus. I was miserable my first five years as a Christian. I felt awkward, like I really didn’t belong and if people ever noticed me they’d say, “How did she get in here?” Finally, I realized that God Himself loved me, in fact He made me and the Bible says He “’sings over us with joy.” Really? It seemed too easy. Yet I found that my ability to love came from looking for Jesus, and finding Him in the midst of everything. It came from then doing the next thing, usually something practical and ordinary, often not understanding why. It came from just following the Master’s lead…step by step. When I was in sixth grade, my parents signed me up for ball room dancing. If you ask me, that’s why we all rebelled in the sixties. It wasn’t the war, it was ball room dancing. I was at least a foot taller than every boy and they’d line us up in the gym, girls on one wall, boys across from us against the other. Then the signal would come from Mr. Jones, our instructor, for the boys to pick a partner and I still see them all coming towards us, a charge of goofy boys stuffed in jackets and ties, and the wave would split as they headed for the shorter girls. The white gloves on my hands felt like they were lined with Elmer’s glue. Finally, by default, a boy would pick me and to add to the horror Mr. Jones made them bow and ask, “May I have this dance?” which made them all look like they were just punched in the stomach and getting ready to throw up. Then we’d dance, with our clammy hands gingerly placed on each other, “step-one-two, step-one-two” and I’d stumble- blush -trip through a beautiful dance known as the waltz. Years later I watched couples waltz and was mesmerized by the beauty and sync of their steps, their bodies gliding to the same rhythm, step-one-two, step-one-two and I’d laugh at the memory of Mr.Jones and his ballroom dancing class. I never did learn how to waltz. But sometimes I look at my relationship with Jesus this way. Only he didn’t see me as the tall, clumsy girl that was afraid of people, He didn’t pick me because there was no one left. He chose me because He loved me first. And with each step, He has taught me this dance called love.